bright side of the road: Halloween and Cake!! Wowza I can't believe I haven't posted since mid-October! Well there are a couple things that have happened but most excitingly it was Halloweeeen!!! My favorite holiday of the year! A reason to get foolishly and ghoulishly dressed without judgement! If you remember I made the Pumpkin Cake. I had thought the batter was too thick so I tried it again, but this time with almost a can of water added in and it was much more fluffy. So if you want a fluffy cake, add the extra water, if you want a fudgey cake, don't! Simples! The lovely Ms Sarah H-P Sauce sent me some Halloween treats, including a great cupcake kit with halloween themed papers and RIP tombstone signs so I put them to good use with the pumpkin chocolate recipe. I made 'Rising from the Dead' cupcakes! You will see below I shaped and coloured zombie arms from gumpaste and placed them strategically into the cupcakes. Also below you'll see what I worked on this weekend with the lovely Karen! 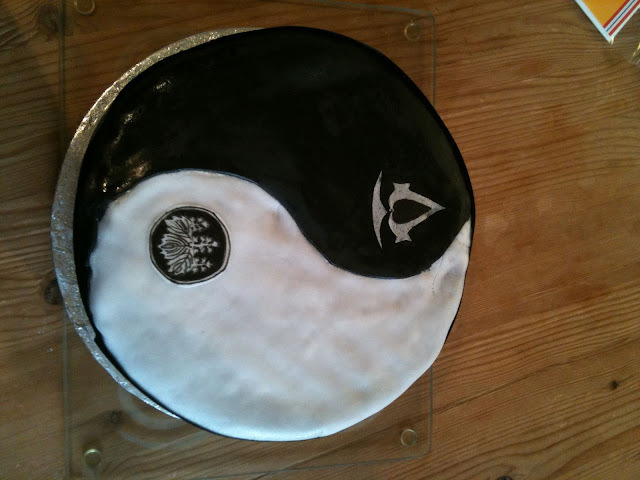 Our friend Dave was having a particularly special birthday and so, with the help of Anita's special family chocolate cake recipe we made a ying yang cake complete with aikido and Assassins Creed logos! Please enjoy and comment if you like them!